CBF student leaders pose for a group photo. As we have shared, last week we gathered student leaders from across the watershed to mark the milestone of CBF's 50th anniversary by looking forward to the next 50 years of Bay advocacy and restoration. Split into five groups with each group focused on a different issue area, these students certainly kept busy during their week of Bay-saving. 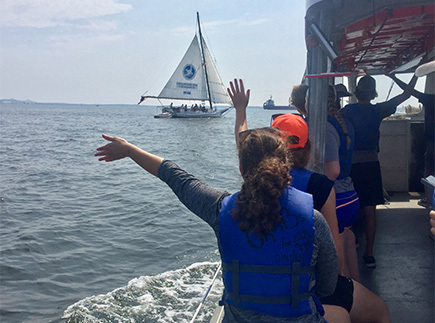 Student leaders from Virginia wave to fellow student leaders in CBF's Skipjack Stanley Norman. In Pennsylvania, students from the Goddard Leadership Legacy Institute spent their week focusing on the conservation heritage of Pennsylvania and the connection of our watershed from the river to the Chesapeake Bay. They got to work by eradicating invasive species and planting riparian buffers at Pine Grove State Park before they began building oyster cages for oyster gardening efforts. Meanwhile, the Pennsylvania Student Leadership Council focused their week on studying the role of agricultural best management practices, aquaculture initiatives, and local cultures in the health and productivity of our waters and our economy. Their week began by paddling down the Susquehanna River and investigating the connection between agriculture and water quality, before they headed south to spend time on CBF's Port Isobel Island Environmental Education Center. 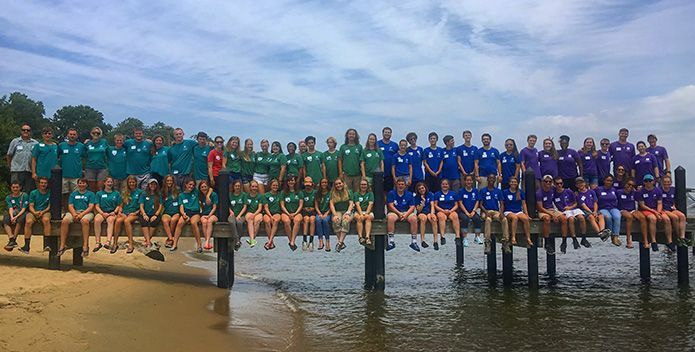 Down in the Old Line State, the Maryland Student Leadership Council spent their week diving into all things surrounding the Bay's beloved bivalve—the mighty oyster. Student leaders worked up a sweat at CBF's Oyster Restoration Center in Shady Side, studied aquaculture operations, and dredged for oysters on Deal Island, learning about the important role oysters play in the Chesapeake Bay ecosystem..
Last but not least, student leaders from Poolesville High School traveled throughout their own Potomac River watershed, studying the essential role trees and forests lay in the health of our water. Students conducted water quality testing and macroinvertebrate surveys along the Potomac River and got a taste of civic engagement visiting Washington, D.C.
Students from Poolesville High School point to their pick up location for their paddling adventure on the Potomac River. Their paddle was part of CBF's 50 Forward program, which took place July 10-15, 2017. 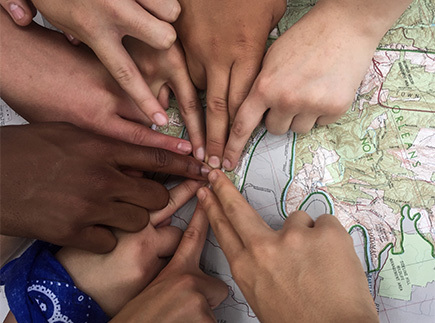 On Saturday, all five groups converged at CBF's headquarters in Annapolis to share what they learned, to discover how they can make a difference, and to commit to protecting the environment in their home communities and speaking out on behalf of their generation. Students engaged in discussions with CBF educators and Bay Leaders, each reflecting on their personal experiences working to save the Bay and sharing their vision for the next 50 years of Bay saving. You can get a glimpse of these fruitful conversations by listening to our latest Turning the Tide podcast, as two student leaders reflect upon their week-long expeditions with CBF President, Will Baker. We believe the Bay and its rivers and streams are worth saving. The Bay's health is improving, but it's future is still in jeopardy. 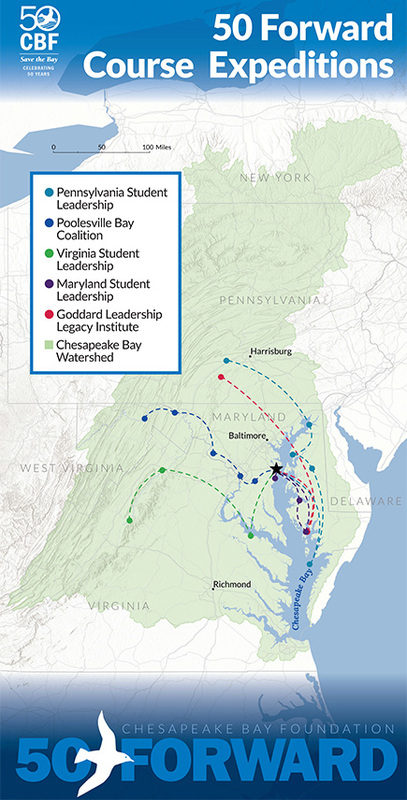 Despite this reality, education truly is the best long-term investment in the Chesapeake Bay. And after spending time with these passionate student leaders, I am abundantly hopeful that a saved Bay is within our reach. Map charting each course as part of 50 Forward, which took place July 10-15, 2017.